This IBM® Redbooks® publication teaches you how to automate your runtime policy by using a centralized policy management system. 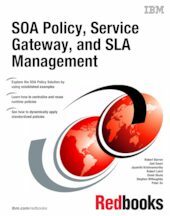 The SOA Policy Solution provides a centralized policy administration, enforcement, and monitoring for runtime policies that enable traffic management for service level agreement enforcement, service mediation, and other customized policies. Policies can be defined once and reused among multiple services, thus enabling a standardized, consistent approach to a runtime policy that saves time and money for implementation and maintenance of non-functional requirements for the enterprise and assists with faster time to market. Business users can use the SOA Policy Solution to help create the service level agreements for their business services to deliver on promises for business performance. IT Architects can use the SOA Policy Solution to architect the policy solution patterns that standardize the runtime policy usage at their organization. Developers select specific policy patterns to implement the non-functional requirements that are associated with their projects. Operations groups provide information about operation needs and create standardized monitoring policy for operational action at run time.